Baroque Musical Forms Word Search Great way to introduce musical forms to your students and have fun at the same time. Enjoy and happy teaching. Contact for custom sheets. Easy and ink saving print. Not heavy on colour/graphics. 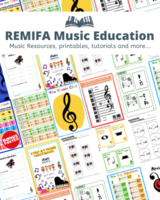 FREE download to get the kids writing music! The sheet has 5 Staves with Treble clef. Unlimited prints and free to share. Happy Teaching. Please follow as new sheets uploaded everyday! The Note Values Print out with both American and British note names. Make sure to follow. New sheets uploaded everyday! Happy Learning and Teaching!